There’s a feeling: the Faces have it, the Beatles had it in the, “Fab Four” days, and Rory Gallagher has it more than anyone. It’s that feeling of being “one of the boys” or “one of us” … it’s that feeling that makes people put their arm around the lad and say “Nice one Rory.” Rory never changes much - shy boy, shaking hands after a gig, and the main thing - playing straight ahead. This album holds only a few surprises, but that is not to knock it. It’s a fine album with Rory playing what he knows best, playing it how he likes to. He starts with ‘Walk On Hot Coals’, rocking straight down the line, pausing here and there to punch out some lovely breaks. The second track is one of the surprises. It’s called ‘Daughter Of The Everglades’ and is largely an acoustic song, still moving along though with lots of slapping tambourines - it’s a different Rory but an attractive one, and he sings better on this track than I’ve heard him sing before. He chugs through Big Bill Broonzy’s ‘Banker’s Blues’, with new keyboards man Lou Martin playing some delightful honky-tonk, in fine, rolling style. ‘Hands Off’ is typical Rory; driving Rock ‘n’ Roll with Martin again adding some lovely decoration. ‘Race The Breeze’ opens side two. It shuffles along at a fine pace, with Rory laying down some tasteful slide breaks and even lacing the song with some lifting, drifting harmonies. ‘The Seventh Son of the Seventh Son’ is the track that displays for me what the album is all about. This isn’t simply a Gallagher album, but a group record. The rhythm section of Gerry McAvoy on bass and drummer Rod de’Ath is so tight, it’s unbelievable, and Lou Martin again and again steals a large slice of the show for himself - he plays piano a lot like Rory plays guitar. It’s a band, and a great one. Just towards the end of the track, as if to reassert his status, Rory takes off in a bitingly superb run - hard as nails and razor sharp. ‘Unmilitary Two-Step’ is a short delightful amble on the acoustic which serves to break the tracks up a bit and also to set the scene for big surprise number two. The last track is Gallagher singing a country flavoured song called ‘If I Had A Reason’. It’s relaxed and easy with lots of steel over acoustic background and Rory sounding a little out of depth with the vocal phrasing. 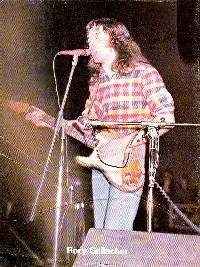 So it’s the same old Rory Gallagher with the odd surprise, the odd direction change. I doubt if it will capture many new listeners, but it’s not going to disappoint any Gallagher freaks either.